Here, you will see two tabs to Auto submit and Schedule. i. 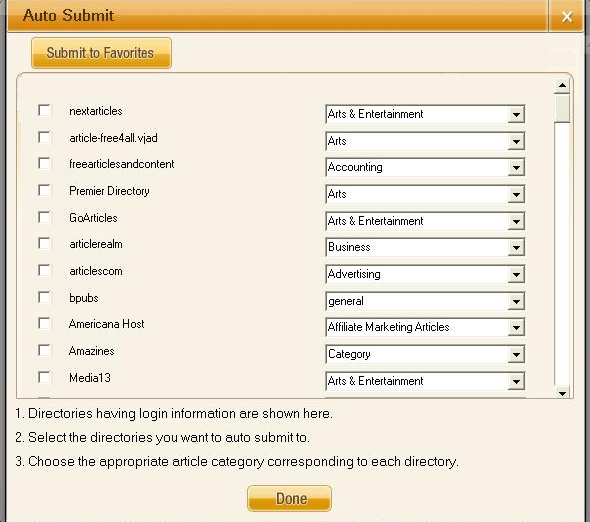 Auto Submit: Allows you to submit an article to multiple directories just by one click. Auto submit can be done only for those directories for which the Â“LoginÂ” and Auto submit property is set to Â“YesÂ”. On clicking at the tab named Â“Auto SubmitÂ” a pop up window will open up on your screen on which you can select the number of directories you would like to submit the article to. In Auto Submit window, only those directories will be listed where Login and auto submit properties are set to YES, and Login information has been added in Edit directory info pop up (Green dot will appear in the login column, next to YES). There is a drop down for Category that is available just next to each directory. You need to select the category for which you want to submit the article. This information once filled by the user gets stored for next use, till the time it is changed by the user. The category information will be used in the submission of articles on respective article directory websites. On clicking Â“DoneÂ” in the pop up window, the Quick Article Submitter keeps submitting the selected articles on the selected article directories one by one. You will see that the directories row will get highlighted as brown or green depending upon the result of successful or unsuccessful submissions on the main section where all the directories are listed. You will see this processing taking place in the bottom frame (Browser section). Submit to Favorites button enable users to submit article to all those directories which have been marked as favorites just by a single click. ii. Schedule: Allows you to do scheduling of an article at later point of time. This section contains three tabs (Schedule, Scheduled Articles, and Reports). Article: This is a drop down that allows you to select the article by its name. The scheduler will be set for the article selected in this drop down. Date: This is a drop down that enables you to select a date from the calendar on which you would like to schedule an article. 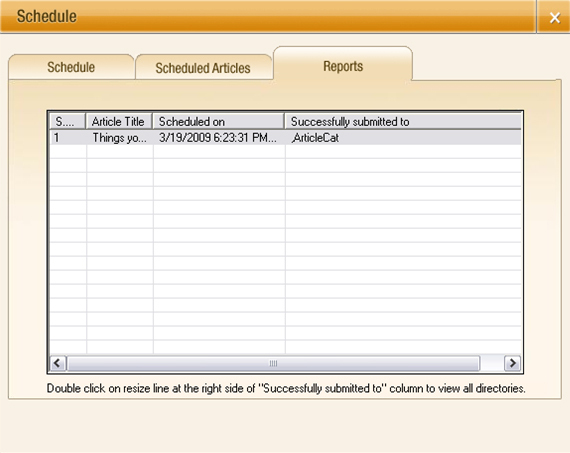 Time: Here, you can specify the time at which you want to run the scheduler for article submission. It can be filled in HH:MM:SS pattern with AM/PM. Sites: It contains the list of the entire sites to which the scheduler can be set. It is a check box with a select all option. Only those directories will be listed in this list for which the Â“LoginÂ” and Â“Auto SubmitÂ” property is set to Â“YESÂ”. Serial number: The first column of the table displays the serial number of the scheduled articles. Article: The second column of the table displays the title of the articles scheduled. 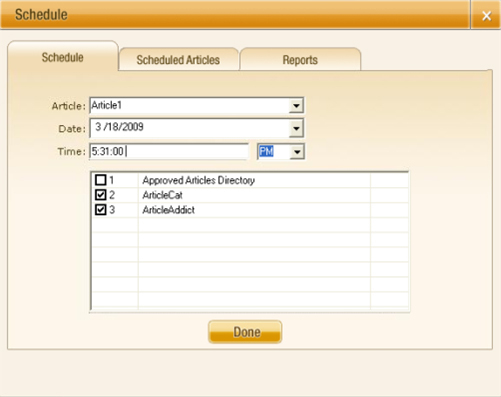 Date and time: The third column of the table displays the date and time of the scheduled articles. Edit: On clicking Â“EditÂ” button, the software will take you back on the Schedule tab, that shows all the setting of schedule article that you can edit. Delete: On clicking Â“DeleteÂ” button, you can delete the selected scheduled article. Serial Number: It displays the serial number of the article. Article Title: It displays the title of the article. Scheduled On: It displays the scheduled date and time of the articles. Successfully Submitted to: It displays the name of the directory or websites to which your article is successfully submitted.